The Master of Business Administration degree was originally created as a forward-looking, modern, scientific approach to the management of commerce. The first MBA degree, offered by Harvard’s Graduate School of Business Administration in 1908, taught a curriculum largely based on the precepts of Frederick Winslow Taylor, one of the first management consultants and an important voice in the scientific measurement and improvement of industrial efficiency. In that sense, all MBA programs today have an important ground in analysis and analytical methods. Decision-making on the basis of carefully observed facts is the cornerstone of scientific management… a philosophy that has more or less taken over modern principles of management. But although Taylor and the first MBA graduates were at the forefront of business analysis as a mechanism to increase efficiency and profit, they wouldn’t even recognize the leaps and bounds analytics have made over the past 100 years. Today, the vast amount of data that can be automatically monitored and generated by information technology massively overwhelms traditional methods of tracking and processing. The enormous power and capabilities of computer-assisted and computer-mediated analytics has spun off into a distinct sub-specialty in business administration. In some ways, an MBA with a concentration in business analytics is the MBA that remains most true to the original vision of the degree. With something like 1000 accredited MBAs available, you almost need an MBA in analytics just to analyze all the programs out there! But you can relax, we’ve put in the time and run the numbers so you don’t have to. You want an MBA in analytics? We put together a list of the best in the United States. Like the big regional accreditors, each of these agencies looks at elements like faculty credentials, curriculum design, and administrative procedures and standards that go into a program. The big difference is that when they look at all those elements, they are looking at them from a business perspective. With major industry ties to active corporations and trade groups, they know what businesses are looking for in management material today, and they make sure these programs are producing graduates with the skills to fill those positions. Of course, there are still a ton of MBA programs with analytics concentrations even after you filter out those that aren’t accredited. So how did we narrow it down to the handful on this list? First, we made sure they fell into the classical mold for core MBA curriculum. If the MBA was originally built around analysis, it was done so on a firm foundation of accounting and financial knowledge, decision science, and marketing theory. If you want to apply your analysis to real-world challenges, you had better have the right context to put it in—that means rigorous, time-tested lessons in all of those departments. Next, we looked at the class format and delivery options. If the school didn’t offer at least some courses online, we chucked it. In today’s fast-paced, connected world, you can’t take an analytics specialization seriously if the school offering it can’t even put together an online option for busy professionals. And even then, not all online programs are created equal. The technology platform that you interface with has a major impact on your experience as a student, and even with how well you assimilate the information coming your way. This is why we did our best to select only programs that have been at the online course content delivery game long enough to hone their platform and provide students with something truly engaging and effective. Then we took a hard dive into the specialization courses themselves. Again, technology was a big factor in our selections. Analytics doesn’t happen on paper today; it happens at light speed in massively parallel processing architectures running bleeding-edge code on diverse data structures. If a program can’t help you at least get familiar with the underlying tech, it’s not for you. We also looked at the reputation and ranking the school itself holds in the business community, taking into account rankings by U.S. News & World Report, Princeton Review and other perennial favorite b-school lists. If there were clubs or campus-based centers for study and research, that was a big plus, too. Finally, we prioritized experiential teaching techniques. Programs that put you together with a real-world mentor for guidance, or offered internships or integrative capstone projects that put genuine business data into your hot little hands for analysis got higher marks. There’s nothing that can exactly simulate what it takes to crunch dirty real-world datasets and come up with something definitive enough to be useful in formulating a business strategy, so you want a school that will let you go toe-to-toe with live data. In the list below, you’ll find programs that check all these boxes, along with the raw data on admissions requirements and special features that made us sit up and take notice. We’re confident the right program for any graduate student looking to study business intelligence can be found on this list, and that you’ll also find all the information you need to help you in making that selection. Although John Brown is one of the largest MBA programs in Arkansas, they still keep their class sizes small to ensure personalized instruction for every student. That’s the kind of attention to detail you will come to appreciate as you dive into the concentrated analytics specialization in market research and consumer insights. Businesses today have more data than ever on their customers, but they don’t always have the expertise to extract meaningful information from it. Worse, they may not know what to do with that information once they get it. An executive with an MBA focused on consumer analytics answers both of those problems. By taking the concrete core business administration courses in managerial accounting, economics, and strategy and combining them with the latest in quantitative marketing research, digital analytics, and consumer insists and decision making, you get a ninja-like skill set in taking big consumer data sets and translating them into actionable business and marketing strategy. You’ll get paid a lot more for those skills than an actual ninja with a JBU MBA to your name, though. Completing the business analytics concentration in the MSU MBA program will qualify you not only as an expert data analyst in your own right, but also as a manager of data analysts and other business intelligence experts. You’ll gain all the fundamental technical skills quantitative analytics that you need to break down a business enterprise into the core elements that describe it, but you’ll also be trained in the leadership traits, strategic sensibilities, and high-level managerial practices that allow you to understand all those elements in the larger context. Because MSU’s program has some of the most in-depth technical training in modern descriptive, predictive, and prescriptive analytical techniques that you will find in any MBA program today, you’ll have the ability to put together and manage any serious business analytical unit from the ground up. It’s a skill every modern business needs and that employers are desperate to have. Business analytics is an exciting field with new opportunities for managing corporations more efficiently and successfully than ever before. If you opt into the business analytics track at CCSU, you will learn all the key elements of data based decision making. You’ll assist in developing new techniques in data management and you’ll study some of the latest trends in forecasting, predictive modeling, and cluster analysis. All of this comes on top of a general education in business subjects like finance and accounting that will help you focus in on exactly what numbers you are going to be analyzing and how they are derived. The combination will make you a formidable business executive with hot prospects in any industry. UB might have the most honest business analytics MBA concentration on the whole list—analytics intelligence is a better way of looking at how businesses are actually using the vast volumes of data and computing horsepower they have access to today to glean insights and actionable intelligence. That intelligence, though, isn’t worth much without the business knowledge and skills to take action in altering processes to improve outcomes. UB lays the groundwork for you to develop all those skills through a solid core study of basic business principles combined with specialized classes in decision support systems, technical concepts for analytics professionals, and foundational principles in advanced enterprise analytics. 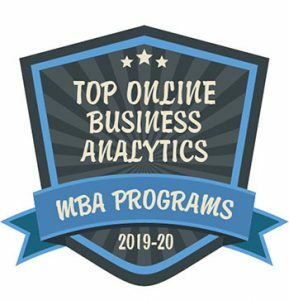 Wilmington University’s MBA in Business Analytics will prepare you with the skills and connections you need to serve as a leader in today’s dynamic business climate, while the fully online delivery will accommodate your busy professional life. Designed for emerging business leaders like you, the MBA in Business Analytics features a relevant, contemporary curriculum that’s overseen by an expert faculty of active practitioners. You’ll study topics in quantitative business analysis, business analytics forecasting, and advanced statistics through accelerated, seven-week courses designed to be both manageable and convenient. Other reasons you’ll love this program include a focused curriculum of 12 courses that can be completed in as little as a year…a comprehensive Student Success Center that features tutoring services, workshops, seminars, and online learning resources…and an outstanding value (one of the lowest in the region). Nova Southeastern University’s MBA in Business Intelligence/Analytics is about identifying, gathering, extracting, and analyzing raw data in a business context, and it’s going to take your career to the next level. From data mining to business modeling to data warehousing and benchmarking, you’ll be able to make significant contributions to your company with an MBA in Business Intelligence/Analytics under your professional belt. Choose Nova Southeastern for this in-demand course of graduate study and you’ll be able to complete the entire program online, or on-campus, if your schedule permits. With five start dates throughout the year and a robust curriculum of accelerated classes, you’ll be able to earn your MBA in as little as 21 months. As an online student, you’ll enjoy outstanding, web-based instruction, access to interactive learning opportunities, and superb communication and collaboration with your peers and instructors. Business Analytics is just one option in a famously flexible curriculum at the UI-Urbana-Champaign MBA program, but that flexibility can work out to your benefit even when you’ve chosen a specific concentration. You can further focus your analytics specialization by selecting such optional courses as customer and social media analytics, or diving into business process improvement and enterprise database structures. Since data analytics is a broadly applicable skillset, you can tailor your expertise in a specific field to direct your career. Through the Action Learning program, you’ll get a chance to put that expertise to work every semester with real-world clients, crunching real data. That’s exactly the sort of experience that employers will care about when you graduate, and the kind of education that will get your resume moved to the top of the stack. Big Data is already the next big thing in business intelligence, and corporations are hurting for expertise in processing and analyzing all the information coming in the door. Data scientists are a hot commodity, but running close behind them are trained executives capable of supervising, directing, and interpreting for those scientists. DeVry, a major force in flexible online education, is on the case, though. Their MBA has one of the best business analytics concentrations in the country. They blend management theory with real-world application of business intelligence gathering and processing, focusing on practical applications that tie directly in to overall business goals and strategy. You’ll get the highly technical information you need to understand what’s happening under the hood in the data processing department, but also the broad-based business education to give you insights into how that data can be used to improve operations or enter new markets. The Doermer school prioritizes experiential learning, an approach that is particularly important in the business analytics concentration as real-world analysis tools and techniques seem to change almost daily in the digital world. But since you’ll be working with real business executives on genuine corporate projects, you’ll have no problem picking up the latest skills. If you are currently employed in a professional capacity that can apply those skills, you can even use projects at your current employer as part of your training, getting credit for school and brownie points at work all at the same time. You’ll also have a heavy helping of the theoretical aspects of analytics, from revenue management to value-based pricing analysis… the kind of numbers that really make businesses tick. Business decisions are based on data. Every MBA program in the country will try to improve your decision making and analysis skills as part of the core curriculum. But the problem today is that there is more data available than ever, and it’s more and more difficult to process without advanced analytical skills and technical assistance. So a data analytics concentration is a natural fit for your MBA, and the courses at USI are some of the best in the country to help you get that extra edge in data-driven decision making. With courses in applied business analytics you’ll come to understand the basis of quantitative analysis of data, and with further instruction in information visualization and washboarding, you’ll get the skills you need to present that data and build your business case in a way that everyone in the organization can use and understand. Frostburg’s business analytics concentration is brand new, but the school is an old hand at getting MBA graduates out the door on time and with a professional education. An accelerated 12-month program option gets you into the workforce with as little delay as possible. Now that business analytics is on the menu, you can graduate fully equipped to deal with the complexities of the modern business enterprise. Data gathering and analysis is critical to almost any aspect of business today, and you’ll get a four-course setup in exactly how to manage those functions as an executive. Merging those skills with the general business education you get through the rest of the curriculum will make you a formidable manager for any company. The Business Analytics concentration at UMass Dartmouth is STEM approved. Although it’s a category that’s most important for international students, it means something to anyone interested in specializing in business analytics: it means the courses are the real deal, heavy in science and technology, not just a set of buzzwords splashed onto a veneer of traditional business instruction. The analytics courses also emphasize hands-on experience, which means you can expect to get into data mining and visualization tools to take the numbers and wring effective information and presentations out of them, designed to have a real effect of business decision-making and strategy. As part of your required ePortfolio repository of coursework accomplishments through the program, you’ll be able to use those projects as examples to wow potential employers after graduation. Baker College’s MBA in Business Intelligence is the epitome of excellence in online learning. Designed specifically for working professionals like you, the MBA in Business Intelligence seamlessly combines technology and management to produce a truly comprehensive course of study that will provide you with a deep understanding of emerging technologies, management support systems, and more within today’s global business environment. Just some of the areas of study found alongside the MBA core include management information systems, business intelligence, database design and management, and data warehousing. While you’ll study from a distance here, you’ll never feel alone, thanks to an outstanding network of resources available through the state-of-the-art Academic Resource Center, accessible 24/7. Bellevue University’s MBA in Business Analytics is your ticket to career advancement in today’s data-intensive business world. From using analytical tools to translating information to converting that information into reliable forecasts, a graduate degree in business analytics, alongside a solid MBA core, is the innovative and relevant curriculum emerging leaders like you need to achieve the most success. This robust and rigorous curriculum, developed by accomplished business leaders with their fingers on the pulse of today’s rapidly evolving global business environment, is available in a fully online format to accommodate busy, working professionals who must successfully manage their professional and personal obligations while earning their MBA. This asynchronous program allows you to study wherever and whenever it’s most convenient for you, while small class sizes and online forums ensure the best in collaboration and communication. Bellevue even offers a cohort MBA for students interested in studying alongside their peers in a more intimate, group environment. A faculty with real-world business expertise and a curriculum that features relevant case studies and simulations round out this comprehensive course of study. And for online learners like you, Bellevue always has you covered, thanks to 24/7 tech support services. Concordia University Nebraska is where business professionals like you turn to become strong and dynamic leaders within your organization. As a student of the fully online MBA in Business Intelligence, you’ll follow a solid MBA core that’ll prepare you in the fields of communication, ethics, and decision-making as you explore topics like strategic analytics and data visualization that will enable you to make the best decisions based on data-driven metrics. You’ll love the flexibility this fully online program offers adult learners like you. Choose the traditional MBA and you’ll graduate in 24 months or choose the Fast Track option and you’ll be able to go from student to MBA grad in just 18 months! The convenient, eight-week classes allow you to quickly progress through the program while Concordia’s team of enrollment specialists ensure you’re always on the right track to achieving your academic and career goals. UNO offers a flexible, state-of-the-art MBA program that has an innovative core of courses that go outside the bounds of the typical MBA curriculum to bring your education in line with modern business practices. You don’t just learn about ethics; you learn about ethics in the context of social responsibility. You don’t just sit through droning lectures on MIS; you learn the potential of technology to connect people. These in-depth takes on traditional business concepts extend into the business analytics concentration, which covers forecasting and visualization methods, teaches you how to put together a data analysis program from scratch, and gives you the low-down on modern tools used for data analysis. It’s not just the 20,000 foot view, either—you’ll get your hands dirty with Python and other popular programming languages used for data manuring and sorting, giving you the kind of credibility you need in the trenches to manage today’s data science professionals. Innovative mobile app allows you to view coursework on your device as well as communicate live with faculty or fellow students. Lifelong access to archived online course material. Immersive on-site residencies offer real-world business experiences with your professors and fellow students. Virtual campus fosters student engagement. If you’re looking for a first-class program in business administration that also offers a flexible specialization in business analytics, then Syracuse is the place for you. One of the finest online coursework experience in the country wraps around a top-rated MBA program that also happens to offer some of the most expansive analytics offerings you’ll find. Analytics is a broad field and you’ll appreciate the option of being able to drill down into areas such as accounting, marketing, or finance in addition to getting a general overview of business analytics. Your skills in data collection and visualization will be on par with any data analyst while your executive management training will make you at home in the C-suite or at any customer presentation. When you sign up for a concentration in business analytics, you already know you’re going to get extra courses on descriptive analytics and information analysis and management. But the UNC Wilmington analytics specialization opens your horizons even further, with additional courses available in prescriptive and predictive analytics as well as analytical programming. These detail-oriented courses get to the heart of data analysis and offer a level of expertise to newly minted MBAs that many programs skip over. Rigorous instruction in modeling and statistical inference will have you halfway to being a quant yourself. But the core business and management skills you get with the base program set you up for leadership and executive roles as that rare manager who not only knows the subject matter, but also has the deft touch to motivate and lead employees to excellence. Although there are some natural associations between data analytics and information technology in today’s business environment, most schools separate their concentrations in those areas into different categories. But at Lenoir-Rhyne, you can get the best of both worlds by taking their MBA in Business Analytics and Information Technology. The specialization courses offer a broad range of content that is both specific to each field as well as crossover skills that are applicable to both, such as project management and business information systems. By getting into the underlying collection and processing systems as well as the overarching analysis methods, you’ll be a double threat in any organization. And because the Lenoir-Rhyne MBA maintains a managerial emphasis across all concentrations, your career potential is through the roof. NSU makes it hard to choose between their different specialization options. The school has strong health care courses and an attractive concentration in healthcare administration; it also has a strong business analytics concentration. So the place where they blend flawlessly is in the healthcare informatics concentration. The more specialized your MBA specialization, the better it helps qualify you for positions in that particular field. Healthcare is a complex field in its own right, but that is exactly the reason that advanced computational analysis has taken off there. Applications of quantitative and qualitative analysis to healthcare data have real implications to both the business and medical aspects of the industry, and executives who have a strong command of those elements are in real demand. With courses in project management and health services technology, NSU will position you to fit into that niche at any size medical organization. Community involvement in beautiful Ashland is a bonus that pays back the effort with rich experience in a thriving, art-oriented town. The SOU School of Business is known for cultivating innovation and an entrepreneurial attitude in all their programs. The Business Analytics MBA is no exception, and it just might be that analytics is even more important in the small business and startup world than anywhere else. With thin margins and a narrow path to success for most startups, having a detailed command of the numbers down to the very last percentile can be the critical difference between a thriving business or bankruptcy. The analytics concentration at SOU has a decidedly technology-oriented focus, closely aligned with the modern realization of analytics as a Big Data-driven exercise. You’ll have an advanced MIS course on business analytics and learn how to put together business information systems to support data gathering and future analytical models. Together with the common critical courses you’ll find in any MBA program such as accounting, strategic operations management, and legal topics, the analytics focus will set you up to take on an executive role at businesses large or small. Full-time and part-time program options. Graduate minors available in seven subject areas in addition to concentration options. Modern business runs on numbers, and there are more and more of them every day. Drexel’s business analytics concentration doesn’t mess around when it comes to preparing you for that new reality: you start off with a core requirement of datamining for managers that sets you up for even more intensive courses down the line. Customer analytics, decision support, predictive analytics, system simulation… even a course on Six Sigma is available to round out your understanding of how to gather, analyze, and apply data to improve business efficiency. Since you’re getting a high-quality education in the general aspects of finance, accounting, leadership, and everything else that goes into making the modern business executive, you’ll know exactly what to do with all that data once you get your hands on it out in the real world. Delivery: Online or on campus. Entrance Exam Requirement: GMAT, GRE, or waiver. Courses in DBMS, DSS, and ES software packages for hands-on experience with analytics tools. Ranked #4 by U.S. News & World Report for highest percentage of grad student job placements within three months of graduation. Listed in the Best 294 Business Programs by Princeton Review for 2018. La Salle offers a solid core of basic business foundational courses to all of its online MBA students: managerial accounting, financial performance, marketing management. You’ll get a well-rounded business education no matter what specialization you choose. But the business systems and analytics specialization goes further, diving into the intricate technical issues around database design and business systems analysis. You’ll learn about data warehousing and data mining, vital topics for even smaller businesses in this day and age of massive online data collection. The La Salle program does an excellent job of bringing together business considerations with technological capabilities and showing you how to use each to support the other. Hands-on experience in database and analysis software differentiates this program from many of its competitors. Point Park University’s MBA in Business Analytics is at the intersection of business analytics and big data and it’s where you’ll take your business acumen to the next level. This 36-credit, fully online program features a comprehensive MBA core, complemented with theoretical and application-based coursework in the areas of applied data mining, business analytics, data analytics and visualization, and more. A strong, relevant curriculum, taught by an esteemed faculty of expert practitioners, is at the heart of this program, which can be completed in as few as 18 months! The Data Analytics specialization at DeSales scratches one of the big itches for corporations operating in today’s complex business environment: turning out graduates who can make sense of the oceans of data that are available with modern collection and computing systems. The DeSales program provides a 50,000 foot overview of the subject with a course in statistical analysis and predictive modeling, then quickly dives down into the gritty realities of database management, data mining and visualization, or decision support system construction and operation. With the combination of that kind of relevant, up-to-date information and a solid practical foundation of fundamental business skills training, you’ll get the right combination to take on any analysis project after graduation. The UTC MBA program starts you off with seven core classes in topics such as organizational behavior, information systems, economics, and entrepreneurship… all the general business education classes that you expect in an MBA. But if you select the business analytics concentration, you will get the key that makes all that other knowledge really start ticking: practical, logical training in the use of databases and quantitative and statistical analysis techniques to make data-driven decisions for rational, measurable outcomes in all your business initiatives. Data makes the world go around today, and as an MBA with advanced skills in descriptive, prescriptive, and predictive analytics, you’ll be better positioned to take on executive leadership roles and help organizations succeed. A quick, inexpensive, engaging, collaborative, and convenient MBA program with a strong dose of cutting edge business analytics techniques… what’s not to like about the TAMUK online MBA program? The Business Analytics certificate option sends you out the door at graduation with not just your diploma, but also a transcripted certificate in business analytics that will have employers in any sector sitting up to take notice when your resume crosses their desk. With background knowledge in databases and data warehousing and exposure to the latest predictive analytics and exploratory data analysis methods, you’ll be equipped to slice and dice any type of information in any industry. More importantly, with your grounding in business accounting, economics, and managerial processes, you’ll be in a position to know what to do with the results of that analysis. That’s solid gold for businesses, and for your career. All business today is global business in at least some sense. Even the smallest regional manufacturer is affected by the currents of global trade, and executives had better be prepared to navigate those shifting waters with both expert skills and in-depth knowledge no matter what their area of expertise. In the business analytics concentration of the Westminster College MBA, that international exposure comes for free. You will start off with a solid core of general business knowledge, including accounting, economics, and marketing. The analytics concentration builds on those with detail-oriented skills including database and programming languages and visualization tools, everything you need to dissect big data sets and distill them into actionable intelligence to inform major business decisions. But the capstone project that rounds out the program takes it all to the next level with a real-world trip to an overseas destination as part of a project focused on a specific region or country, molding your new knowledge around the reality of international business. George Mason University is a big name in business and national security studies, and located right on the doorstep of the centers of American global power. You’ll be engaged with a diverse student body and have the opportunity to network with future leaders in both business and politics. And with the Business Analytics certificate option, you’ll get an incomparable set of tools for adapting technological tools to any modern business activity, from marketing research to fraud investigation. With full-time, part-time, and on-campus options, you can always find a way to work this valuable program into your life and career path. Radford’s College of Business and Economics has put together a flexible MBA program that doesn’t give in on any of the basic principles: a hearty core collection of courses in accounting, economics, finance, and statistics waits for every student enrolled to build the kind of knowledge and leadership skills the modern business world requires. But with a targeted elective set in analytics, you can build your credentials even higher with a stack of qualifications in quantitative analysis, predictive analytics and data mining, and research and reporting. VCU is powered by world-class research, and there’s no field in which that is more important than business analytics. At the cutting edge of quantitative analytics, new search and data science processes emerge almost daily. The VCU MBA program encourages the creativity and innovation required to stay on top of such a dynamic field. You’ll be faced with problem-solving curricula in almost every class, and have the opportunity to put what you learn into practice through the heavily experiential course structure.